A useful tourist guide for Brisbane including smart advices about the cuisine, accommodation options, shopping, activities and attractions in the city. Brisbane is situated on the beautiful eastern Australian coast and it has the third highest population in the country. The city of Brisbane is largely centred on the wide Brisbane River, which meanders its way through the metropolitan area. At night, the skyline lights up with the twinkling lights from Story Bridge, the river cruises and the high-rises that line the banks of the river. Brisbane is seen as the gateway to the diverse array of natural attractions, which can be found in the rest of Queensland. For example, the world-famous scuba diving destination, the Great Barrier Reef, extends along the northern coastline of Queensland. Also, some of Australia’s most beautiful beaches can be found on the east coast, which guarantees a steady stream of tourists that pass through Brisbane every year. Brisbane boasts a subtropical climate and is known for its humidity. It has a hot, humid summer and a dry, mild winter. Due to its proximity with the river and network of small stream through the city, Brisbane has been subjected to severe floods, on many occasions during the rainy season. Fortunately, however, this has not affected its rise to success. 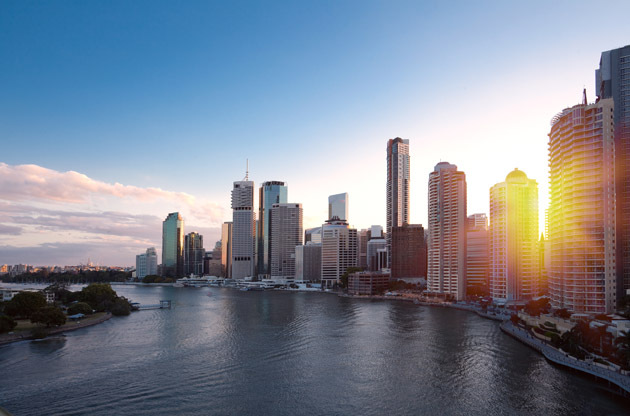 Consistent economic growth has boosted Brisbane to a prominent position in Australia and beyond. It is widely acknowledged to have the largest economy of any city on the stretch from Sydney, in the south to Singapore, in the north; including impressive cities such as Darwin and Jakarta. Its wealth of resources includes information technology, financial services, petroleum refineries, paper milling and a growing tourism industry. It is also invested in developing a competitive science and technology sector in its quest for a stronger position on the global stage. Brisbane is situated on the east coast of Australia, in the state of Queensland. It is the capital city of the Queensland, which is a vibrant coastal destination, endearingly referred to by local Australians as the ‘Sunshine State’. Brisbane lies one hundred kilometres north of the New South Wales border. The international airport provides world-class service to its commuters and it is located fairly close to the city itself. Taxis, busses, trains and private shuttles are available modes of transport between the airport, the harbour and the city. For high-speed travel, there is the fast and convenient option of the AirTrain, which runs between the airport and the city in no more than twenty minutes. The AirTrain also runs to the DFO (Direct Factory Outlets) area; so it really is a great time-saving option for business purposes. Brisbane appeals to visitors from all over the world with a wide variety of attractions across the city. A growing tourism industry means an abundance of activities and interesting sights, with an organised, tourist-friendly infrastructure to welcome curious travellers. The Queensland Art Gallery and the fascinating Gallery of Modern Art are the two top galleries in the city. The QUT Art Museum also offers a must-see collection of creativity and it includes paintings, sculptures and contemporary art pieces. The Bleeding Heart Gallery, one of Brisbane’s hidden gems, is a both a quaint café serving organic teas and coffees and cosy gallery showcasing emerging artists; it is an ideal place for a few moments of respite from the bustle of the rest of the city. Rich theatrical talent abounds at the Queensland Performing Arts Centre (QPAC), in Brisbane’s South Bank precinct. The variety of theatres in this centre provides a cultural injection of riveting dramatic and musical performances, all year round. The banks of the Brisbane River are truly the lifeblood of the city and as such, offer a colourful array of places to explore. By day the water sports and leisure activities take advantage of the Brisbane sunshine. Climbing enthusiasts even have the unique opportunity of scaling Story Bridge, for the wonderful reward of panoramic views of the city. As days turn into night, the river takes on a whole new vibe; non-stop action with amazing fireworks, live music, cultural shows, delectable dining opportunities, quirky markets and of course, the famous party scene. Given the strength of its economy and the booming local tourist industry, Brisbane offers a diverse selection of shopping destinations, especially in the central business district. Fortitude valley is considered to be the top shopping and entertainment district in the city. Known to most by the nickname 'the Valley', this fascinating place is an eclectic mix of old, elegant and sophisticated meets hip, new and urban grunge. Quaint old buildings tucked in between shiny modern ones, it's the ideal place to discover the very beating heart of Brisbane. If you are lucky enough to be around Brisbane on a weekend, be sure to pop across to one of the many open markets, which have become increasingly popular for discerning shopaholics. Markets are spread around the city and include a selection of fashion, vintage, crafts, agriculture, organics, art and ethnic products. The Fortitude Valley area is not only a shopping paradise, but also boasts an exciting array of restaurants, pubs, speciality cafes and high-end clubs. For a great selection of fine dining, the CBD is once again, the recommended starting point. Two fantastic eateries, Restaurant Two and Esquire are just two examples of the quality dining experiences available to enthusiastic foodies. From exclusive gourmet restaurants to classy wine bars and the inviting atmosphere of vintage bistros, 'the Valley' has it all. The West End area, which is only three kilometres from the central business district, also offers connoisseurs a tantalizing choice of culinary masterpieces; it is a very popular fine dining destination for those wanting a break from the buzz of the city center. When night descends on the big city, the mood changes as the night owls come out to play. The live music scene in Brisbane is alive and well, a favourite pastime of the local socialites and a great way to kick back after a long day at the office. From inspiring orchestral performances, to casual “open mike” nights to the classic sophistication of Brisbane’s Jazz & Blues bars, there are endless choices of ways to enjoy the evening. If a sense of adventure begs a more exciting night, the dazzling nightclubs of the central business district and ‘the Valley,’ will certainly seek to fill the gap. Choose from a large variety dance clubs, sports bars and even those of a more exotic kind. There is a day tour that offers a three-in-one day pass to three activities considered to be on the list of ‘must-see’ attractions – it includes a scenic cruise on the meandering Brisbane River, meeting the adorable furry inhabitants of the Lone Pine Koala Sanctuary and unlimited access to the Hop on-Hop off City bus tour that runs between major attractions in the city. Brisbane proudly showcases events such as the exhibitions, tradeshows, fairs, symposiums, congresses and conferences. Many delegates from all around the world come to Brisbane every year for these reputable business events making Brisbane an ideal hub for international gatherings.